This pdf clocks in at 18 pages, 1 page front cover, 1 page editorial, 2 pages of SRD, 1 page back cover, leaving us with 13 pages of content, so let’s take a look! All right, this being an adventure-review, the following contains SPOILERS. Potential players should jump to the conclusion. Okay, still here? Only GMs around? Great! So, this adventure, in a way, is the story of one special ogre called Bruboe, mocked relentlessly by his brutish brethren for his artistic ambition. In exile, he found his calling – becoming a great actor! The audience he found was ultimately that of mutated belching goblins. 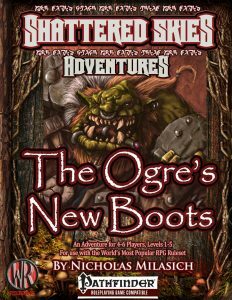 While the ogre has managed to accumulate a variety of costumes, he is lacking good boots – which is where the eponymous new boots come into place. Bruboe has kidnapped Nogget, the best cobbler of Bright Moon Valley by luring him under false pretense with a letter (note that if your game treats literacy as rare…among common folk or ogres…), imprisoning the man. Guess what the PCs are supposed to do? Bingo. The PCs are hire in the Laughing Dragon Inn by a gnomish child and the PCs will probably jump at the chance to offset their ennui. The first encounter, thus, takes place at the site of the ambush, where they deal with the belcher variant goblins left there. While the caravan ambush site does have a map, it is only a small one and no proper-sized version to print out or hand out is included – something that extends btw. to all the encounter maps herein. On the plus-side, the pdf does provide upgrade-notes for higher APLs and even alternate stats. The scaling advice is nice. Tracking the belchers is not too hard, though PCs failing hard at Survival will have a harder time – the more checks they fail at, the worse it’ll become. Particularly successful PCs will find a hidden vale with a dryad. Ahem. Well. The artwork is…nice. Okay, so if you’re sensitive to that kind of thing: The artwork depicts the dryad stark naked, with her wooden behind towards the reader. Personally, I don’t mind, but some readers may be put off by this display of cheesecake. Arriving at the belcher hide-out, the PCs must pass some decent traps and arrive at the grim theatre of the ogre, stumbling on a performance by the ogre – if they play along, they can actually hold off the attack of the belcher and firebat audience. Bruboe is an ogre skald, btw., and comes in a level 2 and 4 version. This would also be as well a place as any to note that the neither skill- nor attribute-checks are consistently and properly formatted herein. Also weird: The finale mentions tiers instead of APLs for different scaling options. The ogre will make a run for it while the PCs slice and dice through the belchers, the PCs will have to hunt him…and pass the captured cobbler, who tells them to trick the ogre into putting on the boots. If the PCs manage this, the boots, suffused with alchemist’s fire, burst into flames, making the combat easier…though why they only burst into flames after putting both on can be considered to be a minor logic bug. There is an optional final encounter after Buboe has been defeated – there are lava children and a magma elemental hidden below Buboe’s base, whose presence accounts for the belchers flocking to the area – getting rid of it represents basically the optional bonus benefit and encounter for the module. Editing and formatting are okay, though there are a couple of issues in the formatting of rules-text. Layout adheres to Wayward Rogue Publishing’s two-column full-color standard and the pdf sports several solid full-color art pieces, mostly stock. The maps in full color per se are nice, but the lack of both proper-sized GM- and player-maps make their inclusion useless for the GM – you’ll still have to draw them. The pdf has no bookmarks, which constitutes a comfort detriment. Nicholas Milasich’s little module is a basic one – in format and length akin to a Pathfinder Society scenario, a type of module it suspiciously looks like. Like many PFS-modules, it’s very combat-centric and extremely linear. The premise is funny and a capable GM can make the unconventional twist on the BBEG memorable, even if the “trick” mentioned for the final stand can be an issue. The bonus encounter feels a bit tacked on and the variant goblins also fall a bit short of their potential. The module per se is not necessarily bad, but neither is it particularly compelling. First level parties can potentially be wiped by the pretty strong opposition – I’d rather recommend this for level 2 – 4 characters. If you have no prep time and need a society-style scenario, then this may deliver for you- as this is PWYW, you may decide for yourself if this is a worthwhile offering for you. It is due to this fair decision that my final verdict for this module will clock in at 3 stars – it may be worth checking out for you, but don’t expect to be blown away.